Dr. Abdallah completed medical school in 1992 and went on to do his general surgery residency at St Barnabas Hospital in the Bronx, New York. After finishing his general surgery residency, he did a vascular fellowship at Deborah Heart and Lung Center in Browns Mills, New Jersey. He is currently board certified by the American Board of Osteopathic Surgeons. 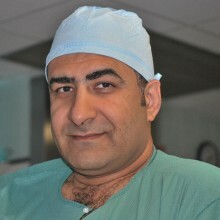 In over 17 years of private practice, Dr. Abdallah has performed thousands of operations covering a full range of vascular surgical procedures, including carotid endarterectomy, aortic procedures both open and endovascular and lower extremity limb salvage using the latest endovascular techniques. He is one of the leading dialysis access surgeons in South Florida. He also performs endovenous laser ablation and sclerotherapy. Dr. Abdallah is Vice Chairman of Department of Surgery at Broward Health North.